A meeting was arranged in Bumborat, Kalash Valley to remove differences between the Muslims and Kalash community in Chitral. District Nazim Maghfirat Shah and officials of the local police station also attended the meeting. The district nazim, who was the chief guest on the occasion, said that a few days ago a Kalash girl, Reena, embraced Islam by her free will, but some people gave a negative impression to it and used the issue to create differences between Muslims and Kalash community. He said although Reena clearly stated in a press conference that she embraced Islam according to her own choice, but misunderstandings still remain between the two communities. He said the meeting has been called to remove these misunderstandings. Other speakers said a number of people from the Kalash community have embraced Islam in Rambor, Bamboriat and Barir valleys of Chitral. However, they said, no scene was created on those conversions and people in these areas are living in harmony and peace. A committee comprising of over ten members each from the Muslim and the Kalash communities was formed on the occasion to ensure peace and harmony in the area. Nazim of village council Bumborate, Advocate Muhammad Rafi, was selected as the chairman of committee. Imran Kabir Kalash, a minority member of the district council, was selected as the vice chairman and Bumborate SHO Abdul Fattah Khan was selected as the secretary of peace committee. The committee will hold monthly meetings to ensure peace in the region. 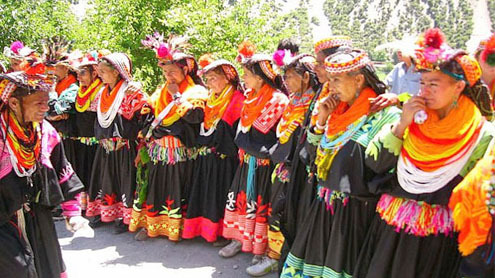 “The purpose of the meeting was to end misunderstandings between the Muslim and Kalash communities and to ensure that both communities live in peace, mutual harmony and love as they did in the past,” a local elder told the news agency. Another elder said it was an important meeting where people from both communities vowed to end differences and live in peace. A large number of people from Kalash and Muslim communities participated in the Muslim-Kalash solidarity conference.